Sibling relationships are complicated. They are a messy mixture of competition, love, hate, stability, and unpredictability. In Melody Anderson’s new play, Liz (Patti Allan) and Lou (Lois Anderson) grow together and apart and together again as they navigate the many complexities of growing up. These two sisters are opposites in so many ways. Liz is the sensible big sister while Lou doesn’t take life as seriously. In a series of scenes, we are given glimpses into defining, profound, or significant moments in their lives. Most of the time, there are there to help and confide in each other. Liz’s first date, Lou’s first tampon, and Liz’s wedding show their strong sisterly bond, but after Lou leaves for Europe, becomes an artists, and accidentally gets pregnant, the sisters gradually grow apart. The thing that brings them back together is the breakdown of their relationships. Liz’s husband leaves her and Lou catches her partner cheating on her. The two spend some quality time together at a resort, and it seems like they are closer than ever, until their mother dies and a whole new series of conflicts begins. Their mother’s death drives a wedge between the two sisters, but eventually the strength of sisterhood brings them back together again. 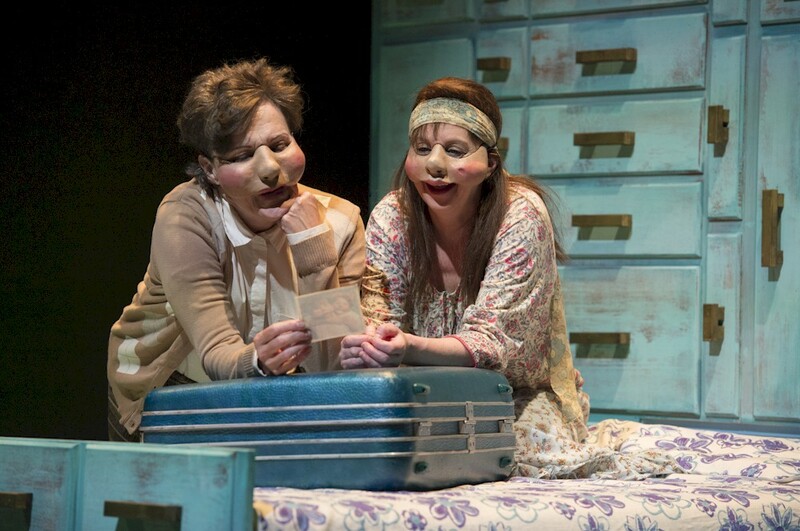 The use of partial face masks (designed by the playwright) is very effective as the actors are playing these characters from childhood to old age. The subtle changes to the costuming (by Barbara Clayden), hair, and a few different masks effectively transforms them into each phase of their lives while setting them decidedly in the various decades they move through. The set also adds a significant layer of interest with its walls of drawers that hold costume pieces and props and also transforms to reveal doors, a bed, a phone booth, and a ladder. The touching tale of time lost and family reunited is strong, as are Anderson’s and Allan’s performances, but the structure of seeing only bits and pieces of their lives through contained scenes at times pulled my attention away from the story and felt disjointed. Despite this drawback, the emotional intensity of the performances couples with the effectiveness of the masks and staging made this a worthwhile evening at the theatre.